During the Chinese New Year holiday, there was a bunch of new Chinese movies released there. One of them was already playing in Indonesia cinemas since last Thursday, but alas it was only playing in very few cinemas in Jakarta and all of them were a little bit far from our home. So when another movie premiered yesterday, which not only played in 1 but all Indonesian cinema chains, it was much easier for my wife and I to see this. It was a sequel to the 2015 hit which we have not seen before but we knew it was funny movie. Hence we searched for the original movie online and luckily it was available. Now let us move on with the film. 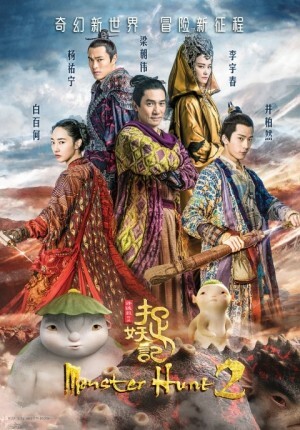 Story started not long after the events from the first movie where Song Tianyin (Jing Boran - Time Raiders, Love O2O etc) and Hua Xiaolan (Bai Baihe - Go Away Mr. Tumor, Love is Not Blind etc) were off to the world trying to catch bad monsters. During their journey, they also met with the Bureau of Monster Hunter with a senior member named Yunqing (Tony Yang - My War, The Founding of an Army) who were trying to capture all monsters. Both Tianyin and Xiaolan were of course still longing to see their beloved cute baby monster Wuba who was living with other monsters. However when Wuba was separated from his group, he was all alone trying to find his human parents. Meanwhile a compulsive gambler named Tu Sigu (veteran Tony Leung Chiu-Wai - Hero, Lust, Caution etc) who was friends with a gentle kind monster called BenBen was not having the best of luck with his gambling addictions. After borrowing lots of money from a lady boss named Zhu Jinzhen (Li Yuchun - From Vegas to Macau III, The Guillotines etc) Tu Sigu had to look for ways to repay her, including to capture monster for reward. So would Wuba be able to reunite with his parents again? Could he elude the capture from other bad monsters? And what would Tu Sigu role be? Find them all in this hilarious comedy movie. As I mentioned earlier, I have seen the original Monster Hunt before watching this one. So it was still very fresh of my mind on the events in that movie, especially the ending. Hence it was not difficult to re-ignite the fun feeling I had. This movie was a very light one where audience were given the opportunity to just have fun and laugh your heart out. My wife and I were entertained by some of the hilarious moments involving Tianyin & Xiaolan's rather comedic & goofy relationship, or the craziness of Tu Sigu's character (Tony Leung nailed it here). But the most fun of it certainly would be the appearance of Wuba. He was as lovable and cute as earlier. The other monster that we quite loved was Benben while the others did not get too much screen time. If we compared the movie against its original, this one felt so much lighter. When you make something so light, there would always be risk of making the movie felt like a senseless comedic film. Yes of course we were entertained by the many fun hilarious moments or touched by the part of Wuba's sad tearful moments involving Tu Sigu and a magician, or the seriously emotional moment under the air balloon. But it really felt like the movie was focusing too much on the comedic part. Perhaps that was the reason why most people (including my wife and I) loved the original more than this one. Although that movie was so beautiful that it raised the bar very high and a bit difficult to match. For the special effects, I think this one was a bit similar to the first movie. The animation was done nicely, even I noticed there was Industrial Light Magic involved when I saw the end credit. The director Raman Hui who also directed the original & was co-director for Shrek the Third, seemed more experienced here and probably have more ideas as he added some funny end credit scene which I think was a bit similar to Monsters Inc. The story also felt that there would be another sequel to complete its trilogy as one story arc had not been completed here. The one thing that I felt missing in here was the appearance of Sandra Ng and Eric Tsang which was too brief and felt more like cameo. They were actually the very interesting characters from the original movie which gave more color to the story. Btw, since this is a comedy movie about monsters, not a lot of people might enjoy them. I was a little bit bothered by the person next to me who was asleep (& snored) from the middle of the movie till almost the end. Not sure whether it was because he was bored or what. If you really want to see this one in the theater, you definitely have to see the first movie to really understand the continuity of its story. My wife and I also loved the ending song by a male which played during the end credit scene but unfortunately I could not find out what song it was. Overall, this movie was an enjoyable fun film that could be safely seen by the whole family. There was no violence scene, the colorful scenery plus fun looking monsters would be appealing to young children, while the grown ups could still enjoy the funny moments as well. I think everyone would really love the very very cute Wuba (especially my wife who wanted to own Wuba. LOL). Recommended to see this one in theater, but please remember to see the original movie first.